The textbook case of misplaced priorities should have the voters in Karnataka truly worried. New Delhi: On the day dates were announced for the very crucial assembly elections in Karnataka, in which both the Congress and the BJP have high stakes, the two parties, instead of getting into poll mode, were busy attacking each other on social media. The reason — two controversial tweets. At 11.08 am, when chief election commissioner O.P. Rawat was still 20 minutes from announcing the dates, two individuals had already done so. 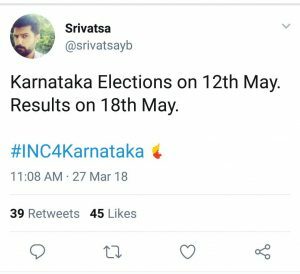 The BJP’s IT cell head, Amit Malviya, and the Congress’ social media in-charge in Karnataka, Srivatsa B., both tweeted the polls would take place on 12 May and counting on 18 May. Incidentally, both got the first date right, and not the second. Both claimed their tweet was based on information flashed by a news channel. 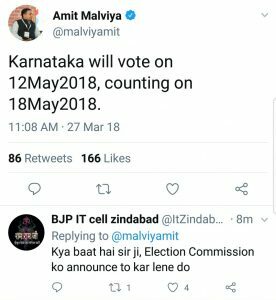 The Congress subsequently dubbed the BJP “super Election Commission” and asked if action would be taken against Malviya and party president Amit Shah, and a BJP delegation visited the Election Commission of India office to clarify its stand and point out that Srivatsa had posted a similar tweet. In an era when social media consumes a significant part of the political ecosystem’s mind space, party members have to be cautious and responsible enough to not try to compete with news outfits to ‘break news’. A news organisation, as part of its profession, can attempt to break a piece of information, and choose to run the risk of getting it wrong. IT/social media cell in-charges of political parties, meanwhile, can barely get away with putting out information, correct or incorrect, before official announcements. While both Malviya and Srivatsa displayed recklessness, causing embarrassment to their respective parties, what made it worse was the decision by both sides to mount an attack on the other over the issue. Neither party clearly has the moral right to question the other. Representatives of both sides erred on this count. However, the continuing exchange between the two sides, and the bid to drag the EC into the affair, is a reflection of the complete lack of depth in the current political discourse. This, particularly after it became amply clear that both Malviya and Srivatsa had based their ill-timed tweets on information from a news channel. It shows how political parties would rather waste time, first over tweeting and then attacking each other on these tweets, than focus on substantive issues, especially on a day when the dates of an important assembly election have been announced. The voter in Karnataka should truly feel worried. The key stakeholders vying for her/his vote are busier fighting Twitter wars than planning how to be the better option on the ground. A textbook case of misplaced priorities, clearly.